Once we found out we were pregnant, one of the first things I started thinking about was the nursery. We have a little guest room on the second floor that is the perfect size and location (right by the master bedroom stairs) ...so it was quickly decided that is where baby girl would go. I have never liked bright colors, or overtly gender specific rooms for kids. Like, we are having a girl... BAM - let's paint the walls bright pink, or shove it full of princess stuff! ....No. Our style has always been very muted, minimal, and neutral - so that is how the nursery will be too. There might be a splash of "girly" here and there (such as the bunny above), but all the furniture and decor will be very modern and you probably won't be able to honestly tell either way if the room is for a boy or girl baby. I found the Hudson collection by Babyletto pretty early on in my nursery inspiration search, and I think that is the set we are going to end up going with. I also found this Nursery Works rocker that looks very mid-century (which you all know I love) and goes well with the Hudson crib and changing table. I would like a little bookshelf of some kind, as I've already started accumulating a little book collection for the baby. Book were so important to me as a kid, and I want to share that with my daughter. I haven't decided on one yet, but maybe something like this? As for decor, most of it is going to be coming from Etsy. There is just so much great stuff you can find on that site! When I saw the crochet bunnies, I just fell in love with them. And this unique mobile will be so cute over the crib. 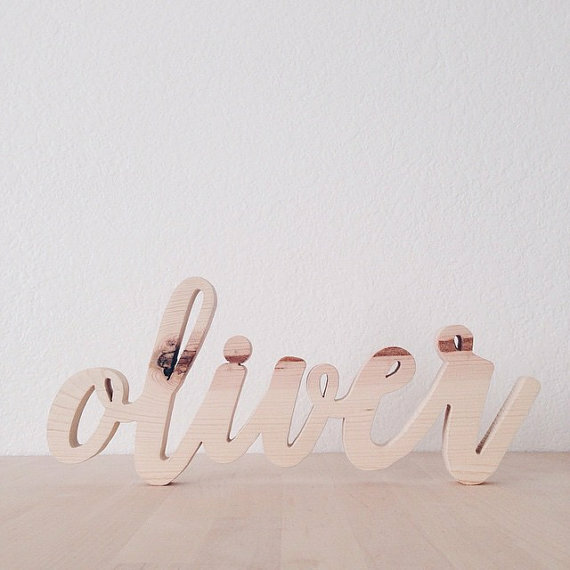 As for the walls, I would love a little wooden carving of her name to hang somewhere - similar to the one above. We have a couple names picked out, but aren't sharing until she is born. Chances are I will order both first and middle name to hang in her room. I also fell in love with these little prints from Amy Hamilton (can be found at Society 6) of baby animals. Aren't they just the cutest?! 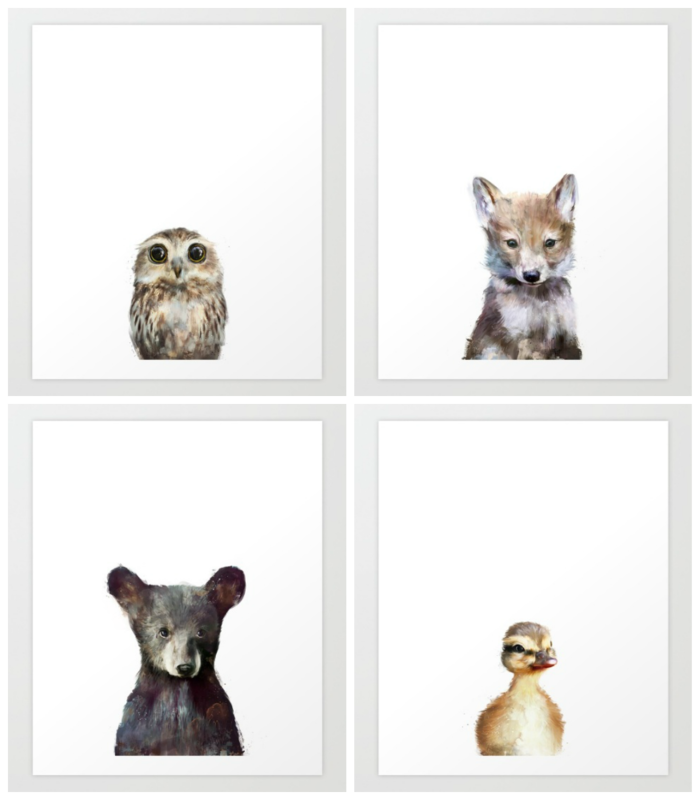 It was hard to narrow it down because they are all so adorable, but the four below are my favorite. I think they would be perfect in this little arrangement for the wall the crib will go on. Those prints are so cute! I love all of your ideas and definitely think I'll be on the same page with not wanting anything too gender specific whenever we have kids.